An international, nine-member jury of accomplished writers have selected the shortlist for the Neustadt International Prize for Literature, with their sole criterion for nominating finalists being distinguished and continuing literary achievement. Any living author in the world writing in any genre is eligible to be nominated. This year’s Neustadt Prize nominees are from around the globe, and, notably for the first time, female authors make up the majority of the finalists. Seven of the nine 2016 finalists are women; previously, the highest number of women nominees in a single year was four. 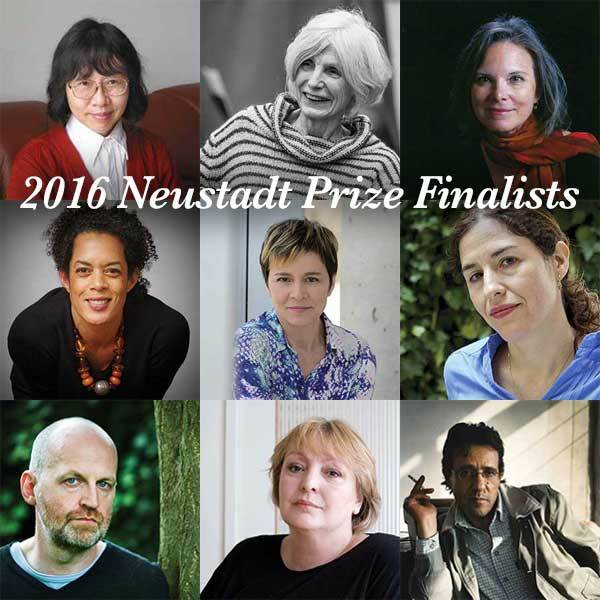 Read more about each author on the Neustadt Prize website, or see the full press release here. Jury members will convene at the annual Neustadt Festival this October at the University of Oklahoma, where they will discuss the merits of each finalist and vote for the winner. The 2016 laureate, who will be announced at the festival’s closing banquet, will receive $50,000, a replica of an eagle feather cast in silver, a certificate of recognition and the next year’s Neustadt Festival hosted in his or her honor. The Neustadt Prize was first given in 1970 to Italian poet Giuseppe Ungaretti. Notable winners have included Nobel Prize in Literature recipients Gabriel García Márquez (1972), Czeslaw Milosz (1978), Octavio Paz (1982) and Tomas Tranströmer (1990) as well as many well-known novelists, poets and playwrights. The 2014 Neustadt laureate was Mia Couto of Mozambique, who was recently shortlisted for the highly regarded Man Booker International Prize. The Neustadt Prize is the most prestigious international literary award given in the United States, often cited as “America’s Nobel” for its reputation as a lead-up to the Swedish Academy’s annual selection.